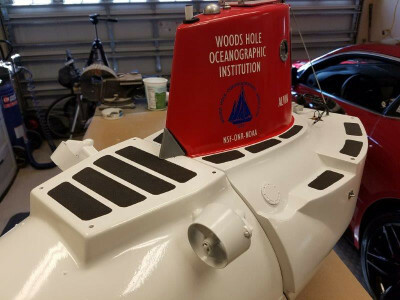 Alvin (DSV-2) is a manned deep-ocean research submersible owned by the United States Navy and operated by the Woods Hole Oceanographic Institution (WHOI) in Woods Hole, Massachusetts. The vehicle was built by General Mills' Electronics Group in Minneapolis, Minnesota. Named to honor the creative inspiration for the vehicle, Allyn Vine, Alvin was commissioned on 5 June 1964. 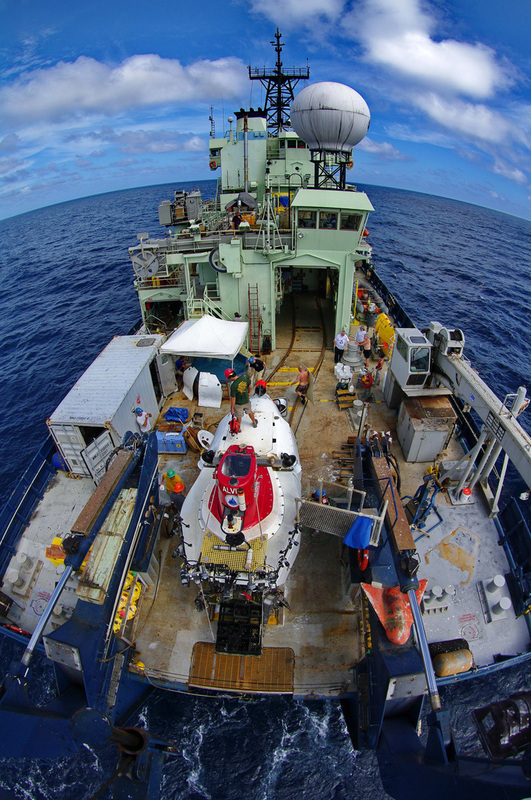 The submersible is launched from the deep submergence support vessel RV Atlantis, and can dive to depths in excess of 14,000 feet. The submersible has made more than 4,400 dives, carrying two scientists and a pilot, to observe the lifeforms that must cope with super-pressures and move about in total darkness, as well as exploring the wreck of the Titanic. Research conducted by Alvin has been featured in nearly 2,000 scientific papers. Approximately ten years ago, we were in search of a new project that would take us to new depths in our lust for unusual radio controlled vehicles. 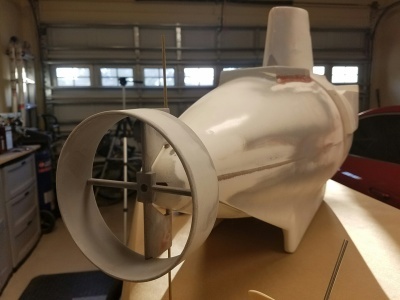 FX Models is based in Groton Connecticut and specialises in custom prototypes used for a variety of highly specialised purposes. They produce a wide range of uber realistic models that are on display in museums, the military, private collectors and of course, the film industry. Their Alvin kit caught our eye due to its impressive size of 1/8 scale and the fact that it has been featured in several National Geographic specials. What's interesting is that when film production is taking place, the Alvin may not be available so a model substitute is used- in this case the FX Models Alvin. Having seen many National Geographic specials on deep sea exploration in the past, we were hooked. After waiting two short weeks, our Alvin kit arrived. 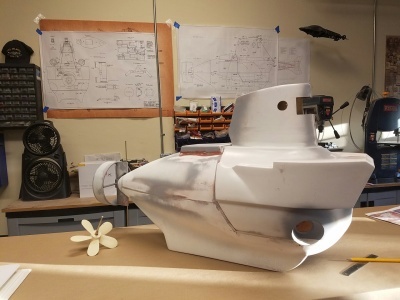 Included in this very scale kit is the outside hull made from fiberglass with a white Gel coat finish, the tail cone, five inch propeller, four cast viewing ports and rolled blueprints. The challenge of this kit lies in the fact that all electronic gear including the running gear, lighting, fixtures and hardware are not included and must be outsourced. FX Models provides you with the part numbers but locating each part is up to you. Ouch. Sadly, our enthusiasm for building this kit has been tempered by other projects, a job change and a lack of time needed to complete this scratch builder's dream. Our Alvin kit has remained in its original packing crate since its initial purchase...until now. Bob Martin of Nautilus Drydocks (Naples, FL) is an expert on r/c submarines and has completed a wide range of sophisticated, scale submarine projects. His engineering background along with his love for these vessels has made him an authority on their design, fabrication and operation. He has also published a number of YouTube videos whereby many of his projects can be seen on his website at www.rc-sub.com. Oh, and we almost forgot to mention that he and his family live in Florida not more than four hours from our home base. We recently approached Bob if he would be interested in taking on our project and he emphatically answered: "Yes!". Eureka! We are good to go. The only downside is that Bob has a long waiting list of projects that are currently in line ahead of ours. Fortunately, we are in no hurry and gladly packed up our kit along with blueprints, instructions and shipped them off to Vulcania, Florida. The entire build was documented by Bob Martin on YouTube. Click on the tabs below to view his progress as he takes us from the initial project layout to the final field test.